The Grundtvig Institute at Göteborg University was established in 1997 after an appeal for more collaboration and dialogue with the university from the folk high schools in the region. The same year the university board decided upon a vision to ”further develop a free and democratic university based upon the heritage of N F S Grundtvig”. The Danish priest, poet and writer N F S Grundtvig (1783-1872) – portrait to the left – is considered to be a pioneer within the field of adult education, and with a connection to Göteborg. He proposed a free Nordic Academy to be established in Göteborg. Since 1999 the Grundtvig Institute is involved in an academic exchange with Jadavpur University in Kolkata. Professor Asoke Bhattacharya from the Adult and Continuing Education and Extension Centre at Jadavpur University is the contact person and has visited Göteborg several times. 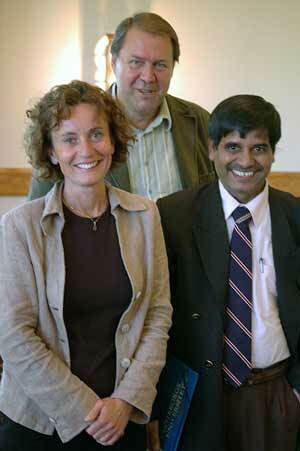 In 2003 Bhattacharya was instrumental in establishing a Grundtvig Research Institute at the university. There Grundtvig’s ideas and theories on education and democracy, and preventing social segregation through continued and adult education are applied. The faculty is also engaged in practical development work among the people of the South Parganas District of West Bengal, for which the faculty has been given the ”UNESCO Award for adult literacy”. The Grundtvig Institute is also engaged in a cooperation with Ljungskile Folk High School that every year during the period August–December runs a ”World course on Justice, Peace and Environment”, including a three weeks tour to north India. In 2003 the former Director of the Grundtvig Institute Ingrid Lomfors travelled along with a group from Ljungskile to the village folk high school Jagriti Vihara in Ranchi, Jharkhand State. The founder and headmaster of this school was himself trained at a Swedish folk high school and therefore got inspired by Grundtvig’s ideas. More information on Jagriti Vihara. In February 2006 Ingrid Lomfors left the position as Director for the Grundtvig Institute, and changed over to work at Göteborgs Stadsmuseum. The Grundtvig Institute organised a half-day seminar on Wednesday 8 September 2004 (G:s birthday). Asst. Prof. Bosse Bergstedt, Dept. of Education, Lund University, lectured on ”From education to deconstruction. On the challenges for adult education in a postmodern society”, and Prof. Asoke Bhattacharya then lectured on ”Let no-one cry out for bread at his table”, where he described how Grundtvig’s ideas have been assimilated into an Indian context.